Kinshofer, one of the world's leading sources of high-quality excavator and loader crane attachments, offers its multi-quick processors, featuring best-in-class cycle times, power, jaw change-out times and power-to-weight ratio. 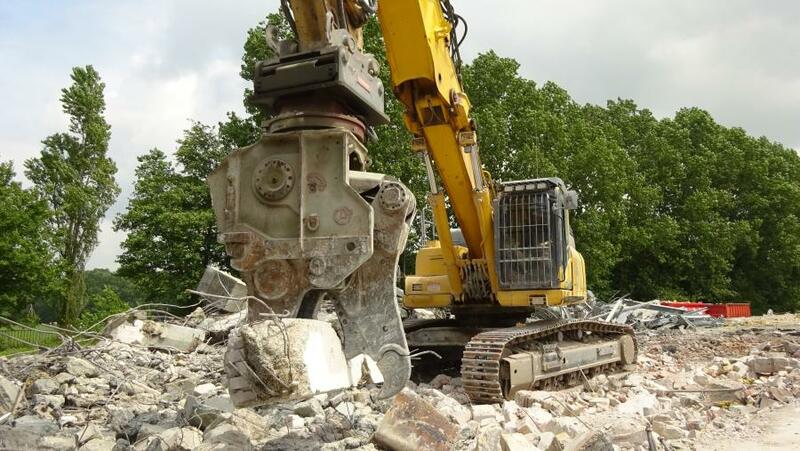 The attachments allow demolition and recycling industry contractors to use one attachment with several jaw sets instead of buying several tools for different applications. Contractors can choose from six to eight jaw sets, depending on which of the four MQP models they choose, including dedicated concrete, steel or tank jaws, as well as combination and specialty jaws. Kinshofer's MQP features the company's DemaPower cylinder technology. The cylinder uses four chambers instead of the two found in other attachments, resulting in 20 percent more surface area within the cylinder. That allows the MQP to exert up to 25 percent more power from a smaller attachment, resulting in the best power-to-weight ratio in its size class, according to the manufacturer. This means, for example, that a section of concrete that may take a competitive attachment five or six “bites” to break through only takes the Kinshofer MQP one or two. 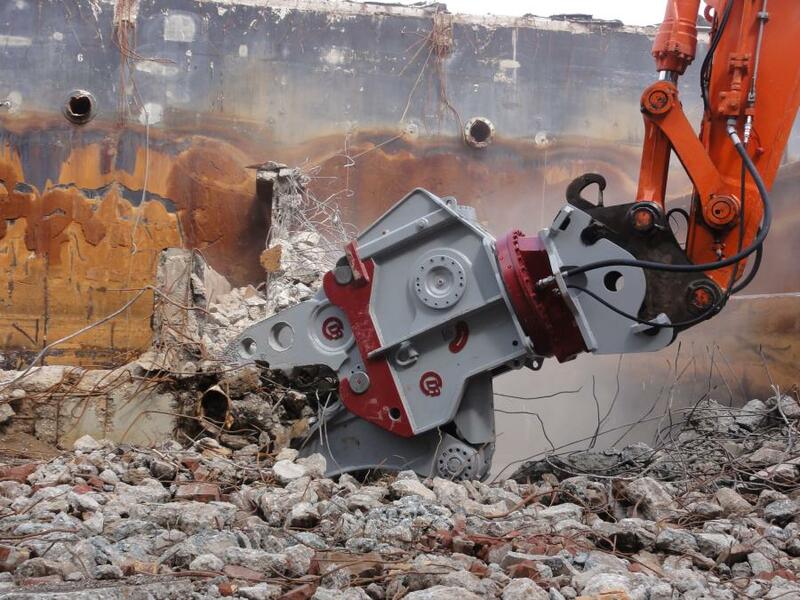 Higher power in a smaller tool also improves efficiency and performance in high-reach demolition, a practice that's becoming more common in the United States. This is both because contractors can use a smaller carrier with a higher-powered attachment and because the attachment's light weight and superior cylinder technology improves fuel efficiency while the excavator arm is fully extended. Kinshofer's double-acting speed valves and innovative cylinder technology also give the MQPs superior jaw closing and opening speed — cycle times as fast as 5 seconds. Other models use a single-acting speed valve that allows only for a fast opening speed or closing speed, not both. The advantage is that the Kinshofer MQP closes quickly, makes use of its power when crushing or cutting material, then opens quickly so the operator can swiftly move on to the next section. With attachment's fast cycle times and high power contractors can complete jobs as much as 20 percent faster, improving ROI, according to the manufacturer. Contractors can change Kinshofer MQP jaws faster, easier and more safely due to the company's DemaLink system. Operators only need to manually remove one pin from the attachment during change-out, compared to three from many competitors. The other two pins are removed hydraulically from the safety of the cab. This system not only removes the hassle of pounding out three pins, but also virtually eliminates the danger of the jaw falling and injuring a worker after the last pin is removed. In addition, DemaLink allows two people, or a single skilled operator, to switch out jaws in minutes and get back to work quickly. In comparison, other models often need to be taken to a shop and take hours to switch, according to Kinshofer. Kinshofer's jaw offerings include the combi jaw for primary demolition and a mixture of concrete and steel; the demolition jaw for primary demolition of heavy concrete structures; the pulverizer jaw for primary or secondary demolition, pulverizing concrete during or after the job, as well as some steel cutting; the steel jaw for primary and secondary demolition of steel structures and scrap; the tank shear jaw for primary and secondary demolition, including demolition of tanks and cutting steel plates; and the universal jaw for primary and secondary demolition of concrete decks. The MQP steel and combi jaws feature the company's DemaGuide system, which uses a guide plate to provide additional stability at the pivot point. The extra stability means greater cutting efficiency and precision. The cylinder also features a trunnion design, ensuring compactness, a better center of gravity and an optimum closing force curve. Once the shims show signs of wear, maintenance crews can adjust the jaw tolerance by simply tightening the main pin. The shims are replaceable in a few simple steps, including loosening the main pin nut, taking the main pin out and removing the jaw. This design also reduces the need for contractors to buy additional bushings and pins because the components can be re-used when replacing the shims, where operations using other multi-quick processors have to torch out the pin and replace both pin and bushing. Kinshofer reinforces the MQP with twin rotation motors. This boosts rotation power and reduces the risk of the attachment shifting or rotating on its own, causing potentially dangerous situations. The MQP also includes a safety system that reduces the risk of dangerously high pressures within the rod cylinder. To reduce replacement costs and service downtime, Kinshofer manufactures all wear parts for easy onsite replacements and exchanges across jaw types. In addition to offering exchangeable cutting edges, an industry standard, Kinshofer features crusher attachment teeth that can be quickly replaced on site. Other units often require putting the attachment on a truck and taking it to a shop for teeth replacement, which can take four to five days, according to Kinshofer. The teeth also are highly robust, especially compared to exchangeable teeth. This ease of replacement combined with Kinshofer's performance-enhancing features deliver a low cost of ownership and fast ROI. In addition, the company designs the tool's oil distributor to include an extra channel to allow for water spray or grease systems. The Kinshofer MQP also includes features to prevent carrier damage in the event of a rotation motor breaking. Engineers designed the tool with rotation circuit filters that catch small pieces of metal that can break off rotation motors and potentially travel through the lines into the valve and then the tank, a problem that can cause $10,000 to $20,000 in damage. In addition to jaws focused on demolition and recycling applications, Kinshofer offers a specialty MQP-Wood jaw for quickly and safely cutting down trees in forestry applications. The manufacturer is also developing an MQP-extreme jaw for heavily reinforced or thick concrete. The jaw features additional ripper tools for better concrete penetration. The MQP-E boasts higher closing force than any other multi-quick processor jaw in the world. The Kinshofer MQP is suitable for 18- to 65-ton carriers.